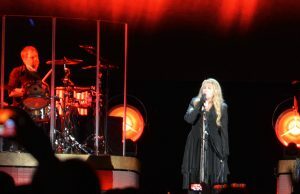 Stevie Nicks told the audience at Royal Farms Arena exactly what she was going to do on Sunday night. And for the next two-and-a-half-hours, Nicks turned back the clock and took the crowd on a voyage where she unveiled her music, which has transcended generations. Nicks looked refreshed as she performed during the final leg of her 24 Karat Gold Tour, which combines recently recorded, previously unreleased songs with the array of hits that have made the former Fleetwood Mac singer one of rock’s most iconic women. She also mixed in songs from her first two solo albums – 1981’s Bella Donna and 1983’s The Wild Heart – that were recently reissued into the 18-song show, which proved that the 68-year-old rocker is still very much young at heart. 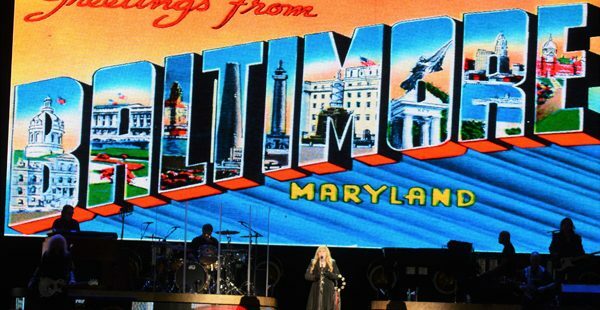 Her unmistakable voice and mainly black attire complete with her 36-year-old black cape were on full display at Royal Farms Arena, a venue she hadn’t played since 1986. But while the building’s name has changed numerous times, Nicks has remained very much the same as she belted out all her hits, including Gypsy, Gold Dust Woman and Edge of Seventeen, which like Nicks have withstood the test of time. Nicks has come full-circle since she last played in Maryland, as she performed at Merriweather Post Pavilion in 2001, 1994, 1991 and 1989. Through her energetic performance on Sunday night, Nicks showed she’s emerged stronger having overcome substance abuse, unhealthy and failed relationships and an industry that seemingly gets younger every year. Nicks has remained a trailblazing role model who has shined as a solo artist when not touring with Fleetwood Mac. Nicks really jumpstarted the crowd when she belted out Stop Draggin’ My Heart Around. Her guitarist took the place of Tom Petty, who teamed with Nicks on the original version in 1981 that headlined her Bella Donna album. As she has all tour, Nicks was expected to sing the song with Chrissie Hynde, the lead singer of The Pretenders, who had to cancel as the opening act because Hynde was sick. While on stage, Nicks spoke of the history of several of her songs. She wrote Starshine, which was released in 2014 on the 24 Karat Gold: Songs from the Vault album, in Petty’s basement, and that her 1983 hit Stand Back was heavily influenced by the late Prince, who helped her record it since it was influenced by his hit, Little Red Corvette. Stevie Nicks played 18 songs over two-and-a-half-hours on Sunday night, closing with Rhiannon and Landslide. 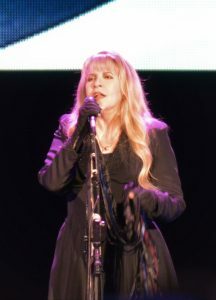 Nicks encored with two of Fleetwood Mac’s biggest hits – Rhiannon and Landslide – the latter of which has been covered at least a dozen times, including by The Smashing Pumpkins, Dixie Chicks, Tori Amos, Miley Cyrus and Bush. “There are some songs that I have played at every show,” she said before closing the shows with the two songs that everyone wanted to hear. Nicks wrote Landslide in 1973 in Aspen, Colo., shortly before her split with former Fleetwood Mac guitarist and boyfriend Lindsey Buckingham, forcing Nicks to reflect on the changes in her life. “I hope your ready” YOUR? NO wonder reputable papers are getting slammed by fake news sources. Come on, guys! Thanks for noting the copying edit mistake.